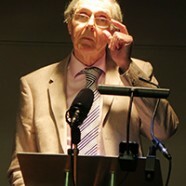 In a lecture delivered in the village of Rhoscrowther, near Pembroke on 26 May 2016, Professor M. Wynn Thomas – for the first time in the public arena – dealt with the effect of the anxiety that Waldo Williams suffered as a result of his father’s loss of sanity. It was because of John Edwal’s ill-health the family moved from Haverfordwest to Mynachlog-ddu so that he could regain his strength in the mountain breeze as the headmaster of a much smaller school. Years later, after the death of his parents, Waldo received treatment for his own severe nervous affliction. The lecturer from Swansea said those difficult early years, when he was at a tender age, had left their mark on Waldo to such an extent that a psychiatrist pronounced he had never come across such an extreme case which had even reduced himself to tears. By using psychiatric analysis the academic explained how this affliction had imbued several of Waldo’s poems such as ‘Cwmwl Haf’ (A Summer Cloud), ‘Oherwydd ein Dyfod’ (Because of our coming) and ‘Caniad Ehedydd’ (Lark Song). He said ‘Cân Bom’ (Bomb Song) could be compared to some of Ted Hughes’s series of nihilistic poems entitled ‘Crow’ because of its sense of hopelessness. However he insisted that ‘Cwmwl Haf’ refers to the sense of security which Waldo found in Mynachlog-ddu. At the same time the ‘spectre of a huge giant’, and his menace, represented his father, whilst the sound of his mother’s clogs on the kitchen floor was the surety of the new security in his life. His anxiety never left him alone and thus to him integration was fundamental. As regards ‘Oherwydd ein Dyfod’ it was made known this was a love poem dealing with the risks of marriage and countenancing joy in the ‘timeless cavern’. The familiar background of anxiety is again clearly manifested. ‘The footfall of my gold girl’ brings security on this occasion. ‘Caniad Ehedydd’ was to be compared to Shelley’s ‘To a Skylark’. M. Wynn Thomas explained that the reference to Branwen’s starling ‘in a day of woe’ brought to mind the domestic abuse suffered by the girl from the Mabinogion. But the skylark rises above all ignominy. 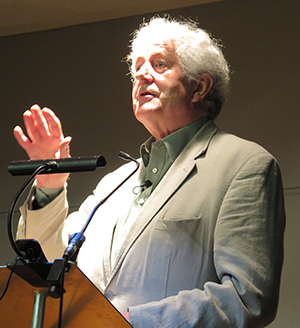 The lecture was delivered in English under the title ‘Waldo Williams – the nobility of poetry’ and hence justified by referring to Wallace Stevens and Seamus Heaney’s definition of the purpose of poetry. But if the lecture had been delivered in Welsh he would have chosen a phrase from ‘Caniad Ehedydd’ as a title – ‘Waldo Williams – cennad angen (heartache’s envoy)’. 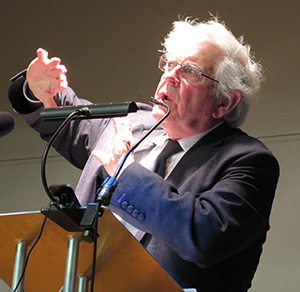 On a lighter note, brothers Prys and Rhodri Morgan conveyed anecdotes depicting Waldo’s oddity as they unveiled a plaque denoting it was at Hoplas Farm nearby that Waldo composed the poem ‘Cofio’ (Remembrance) in 1931. Prys mentioned the unexpected answer he received when he asked Waldo to mention his favourite poem. Quick as a flash he answered ‘Upper Lambourne’ by John Betjeman. “He had even cycled to the village in Berkshire to see for himself the scene at daybreak of the church covered in ivy as the sun’s rays hit her as specifically described in the poem. ‘Oh, were you rewarded?’ I asked him. ‘No’, said Waldo, ’the vicar had been there the previous evening with his scythe cutting the ivy’!. ‘Well, what did you then do?’, I asked, and received an answer typical of him and his fondness for puns. ‘Oh, I cycled home on the wings of the divine wind’. (He made the Welsh word for ‘divine – dwyfol – sound similar to ‘two valves’ (daufalf))! And according to the eminent historian the anecdote, in a way, showed how difficult it can be to reach the muse. An anecdote from the days they as a family spent their summer holidays at Brynhenllan, near Dinas, between 1946 – 1950 was brother Rhodri’s main contribution. The former Welsh First Minister was mesmerised by Waldo’s ability to steer his cycle as they walked down to Pwllgwaelod just by resting his hand on the saddle. He asked him how it could be done. Of course, as Waldo endeavoured to explain and concentrated on the task the cycle would wobble in all directions and keel over. And there was an important lesson to be learned – not to explain how to do something but just to do it. Both agreed that Waldo was a genius and that one could never meet anyone less unimportant his demeanour. The clandestine deed carried out by their father, Professor T. J. Morgan, in conjunction with the historian, David Williams, was mentioned, when a note was sent to the judge of a tribunal where Waldo sought to be relieved from military duties on the grounds of conscience. He had prepared a statement mentioning brotherhood and such matters as divine intervention as associated with William Blake. He said he would be prepared to join the Medical Corps but even then he would feel duty bound to persuade the soldiers to lay down their arms. This was not typical of the usual statements heard in the tribunals. Waldo’s background was explained to the judge and he was released unconditionally. And the irony was that he was already too old to be conscripted anyway. But he wanted to make a stand. 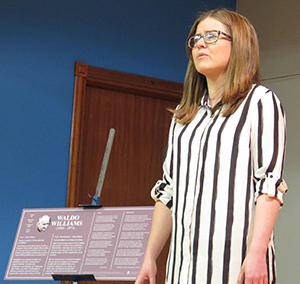 The poem ‘Cofio’ was recited by Angharad Edwards from Maenclochog. She mentioned that her admiration of the poem was such that she had its title engraved on her necklace. All were agreed the remarkable poem constituted the essence of the poetical experience. Waldo succeeded in conveying the longing for all things forgotten in that ‘one short minute’ and the ‘one gentle minute’. The usual story told regarding the poem is that it ‘came’ to Waldo as he harvested turnips on the farm of his friend, the pacifist Willie Jenkins, as the sun set on an autumnal evening. Another version says he had merely gone to fetch the cows for milking. He himself, when in a mischievous mood, would say that he was mucking out the calf pen and the ammonia aroused the muse. But there must have been a great deal of meditation beforehand. Rev Eirian Wyn Lewis, chairman of Cymdeithas Waldo, presided. * It was good to see many local people in the audience. Gwen Smith showed a mug commemorating the birth of Willie Jenkins. She used to live at Hoplas Cottage and her daily task as a child was to fetch milk from the farm. She remembered Mr Jenkins well along with his Irish housekeeper, Miss Donohue and Otto the German POW servant. She could easily imagine Waldo composing ‘Cofio’ as the sun went down above nearby Killpastion Bay. Heulwen Davies from Llanboidy was a distant relative of Willie Jenkins as her grandmother was his cousin. She showed a booklet describing the Baptist cause at Hill Park, Prendergast, Haverfordwest where Willie’s father was a minister. It was during the ministry of the Rev John Jenkins that Welsh services had to be abandoned. The minister hailed from Llanboidy.